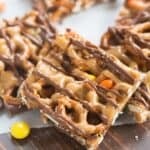 Layers of chocolate, mini pretzel twists and Reese’s pieces candy are topped with a yummy homemade peanut butter sauce. These Chocolate and Peanut Butter Pretzel Bars are the perfect NO BAKE, sweet and salty treat. Life has been crazzzy busy at our house lately. Namely, my little three-month-old has torticollis. It’s not a huge deal and hopefully will be easily fixed with some physical therapy over the next few months. My toddlers are out of preschool for the summer so my days have been turned upside down with mom duties. Like I told my husband when he called during lunch-time and asked what we did that morning: “Nothing, and everything”. “Nothing” meaning nothing super exciting because we were busy doing “everything”–laundry, potty training (which means exxxtra laundry) feeding hungry kids, stretching exercises with baby etc. There is no more important job in the world than being the mama of these special kids, but boy do these three keep me BUSY. Luckily my kids all sleep amazing and go to bed early. So come 7:30pm I have a quiet home and plenty of R&R. Friday night is date night with the Jeff. Whether we go out or dine-in, we always like to share a sweet treat at the end of the night. With how tired I’ve been lately, it’s all I can manage to open the freezer and sneak a few frozen chocolate chips for us. PATHETIC, I know 😉 . He recently requested these simple chocolate and caramel pretzel bars, so I decided to make a little twist on that recipe and add peanut butter! Best decision ever. Start with some melted chocolate. I like the ghiardelli brand of chocolate chips, for melting, or you could even melt a couple of Hershey’s chocolate bars. Throw on some mini pretzel twists and a sprinkle of some Reese’s pieces (one of my favorite candies!). The pretzels don’t need to be in an even layer. Make the peanut butter sauce and drizzle it generously over the pretzels and candy. This is what makes everything stick together! I like to use smooth peanut butter, but if you want some peanut bits in your bars you could use chunky peanut butter. Top the bars with some more melted chocolate and allow it to set up in the fridge. YUM! Only a few ingredients and then end result is a totally yummy, sweet and salty treat. 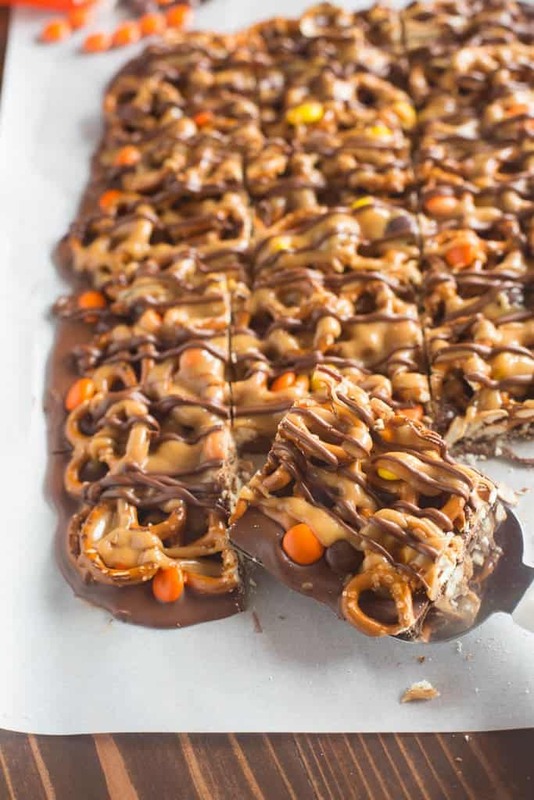 Layers of chocolate, mini pretzel twists and Reese's pieces candy are topped with a yummy homemade peanut butter sauce. These Chocolate and Peanut Butter Pretzel Bars are the perfect sweet and salty treat. Melt 8 ounces of the chocolate chips gently in the microwave (on low heat, stirring every 15 seconds) until smooth. Spread the chocolate evenly over the parchment. 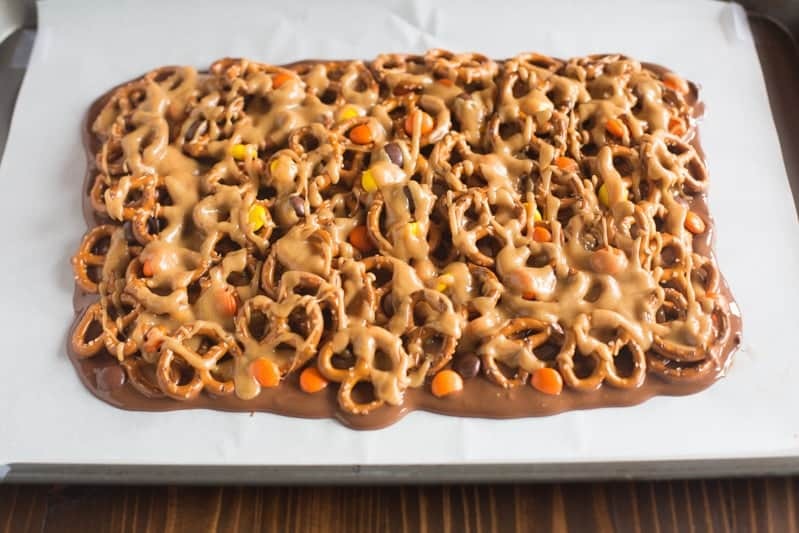 Immediately add the pretzel twists and Reese's Pieces over the top (it's ok if they overlap a little) and gently press them into the chocolate. In a medium saucepan over medium heat add honey and sugar and stir well to combine. Bring to a boil and boil for 1 full minute, stirring. Remove from heat and stir in peanut butter until smooth. Stir in vanilla. 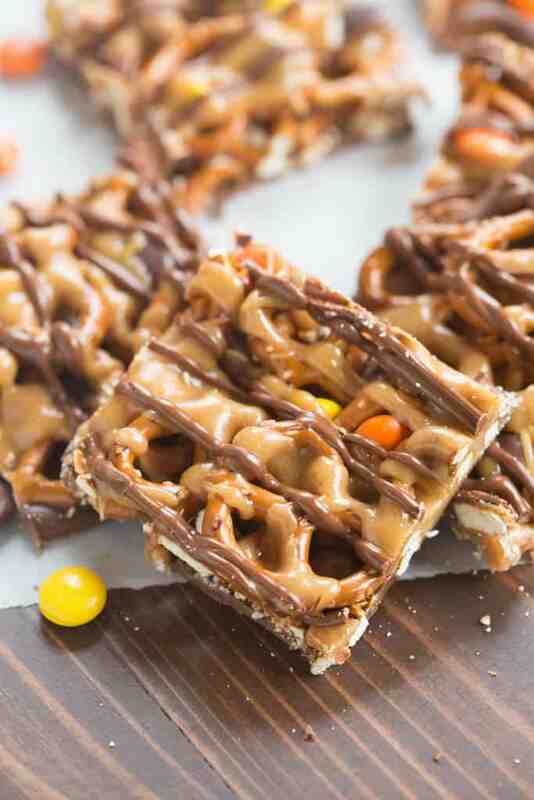 Drizzle the peanut butter sauce over the top of the pretzels and candy. Melt remaining 4 ounces of chocolate and drizzle on top. Cut or tear into pieces. Store in the fridge. You may also like, Graham Cracker Toffee Bars. Tips for the recipe are listed in the post above! What size baking sheet do you use? You can use any large tray or baking sheet (it doesn’t even need to be oven proof). The pan you see in the photos above is a standard jelly-roll pan. Love this, cut down on the honey though, not peanut buttery enough! Can you freeze this or store for awhile in the fridge for Christmas? Not sure if you have ever tried it. A co-worker made these and they are delicious!! I’d love to share them at the holiday but need to make them in advance. Never said to reserve some chocolate to drizzle at the end! Otherwise turned out great and super easy! So happy you liked them! In step two I have you melt just 8 ounces of the chocolate chips, and then in step 4 (after you make the peanut butter sauce) it says to melt the remaining chocolate to drizzle on top 🙂 . If I cut down on the sugar/sweetness will the peanut butter sauce still be able to harden enough? Hi Emma, the cooked sugar is what acts as the glue here. I’m sure you could cut down on it a little, but the more you cut out, the softer the sauce will be.